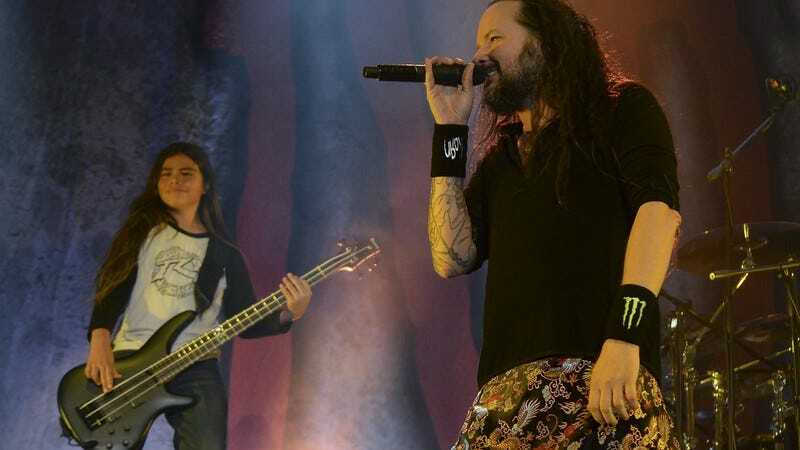 This weekend, we reported that Korn was going slightly outside the box to staff the upcoming South American leg of its current world tour, tapping 12-year-old Tye Trujillo—son of Metallica bassist Robert Trujillo—to play in place of band member Reginald “Fieldy” Arvizu. Lest you think this was just an effort to get in good with metal legends by taking one of their kids off their hands for a couple weeks, though, the nu-metal rockers have now released footage of Trujillo’s first performance, and it looks like he’s acquitting himself pretty well on Korn’s grungy, screaming licks. Trujillo is set to play five more gigs alongside Jonathan Davis and crew, touring through the rest of the month in Brazil, Argentina, and Chile.